Earlier this week 7 delegates joined me in the field for a site visit run by Groundwork Wales, looking at sites which are part of the Healthy Rivers Project. This project was commended as a runner up in the 2017 UK River Prize, and winner of the Urban Communities Project category. This project is a partnership with Groundwork, Natural Resources Wales (NRW), Welsh Water, South East Wales Rivers Trust, Keep Wales Tidy, Caerphilly County Borough Council, and Blaenau Gwent County Borough Council. The project aims to improve river habitats by carrying out biodiversity enhancements and removing barriers to fish movement to support fish populations on the rivers of South East Wales. The group were met in Caerphilly by Matt Sellwood and Gail Devine from Groundwork Wales, who are part of the team who manage the South and Mid Wales rivers. Groundwork aim to improve community regeneration and development through schemes such as the Salmon in the Classroom project, encouraging volunteering jobs in horticulture, and project work to build skills for employability. Indeed, in this project, volunteers helped to implement river structures at many sites. From Caerphilly, we went straight to the first restoration site, a fish easement through a culvert. Rebar has been placed throughout the culvert and 15 timber baffles have been installed and notched to allow fish passage (image on the right). This project involved working in partnership: Groundwork Wales designed the enhancement in partnership with NRW, and volunteers installed baffles by drilling through the concrete to bolt the baffles to the culvert floor. The overall cost of installation was approximately £8,000, including the voluntary time of a consistent group of volunteers who gain qualifications from training on the job. This project has a major environmental impact, and trout have already been observed in both the culvert and through the baffles. Electro fishing is also being carried out to monitor the fish population. After the group had seen the culvert enhancement and got to know more about the work of Groundwork Wales, we travelled the short distance to the second site on Nant Twyn Harris near Ystrad Mynach. Triangular wooden structures have been attached to the river banks at 4m intervals along a 150m stretch (image on the left). 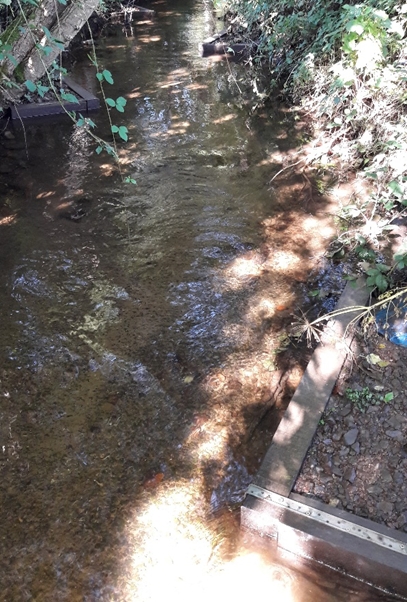 These structures provide flow variability and encourage gravel build up and pool formation, and trout have been observed coming back to the channel. These structures offer a natural, self-sufficient habitat enhancement, which is considered more permanent than alternatives such as installing woody material, and the design had been seen to work elsewhere. This is an appropriate habitat enhancement along a reach in the urban environment, and offered a low cost option. Also at this site, the volunteers played an important role helping in the installation of the structures, and a local college came to the site to help out over a couple of days. Following this visit, the group travelled to the final site before lunch, on the Ebbw River where a pair of baffles have been installed on either side of a weir. The wooden structures are secured at the tip, creating deep pooling areas for fish to rest. The long beams took 2 days to install post-planning, and with the help of volunteers, the installation cost £1,500. We stopped off at the Groundwater Wales offices for a quick lunch and overview of past Groundwater projects including weir notching, blockage removals, enhancements and working around existing infrastructure such as pipelines. 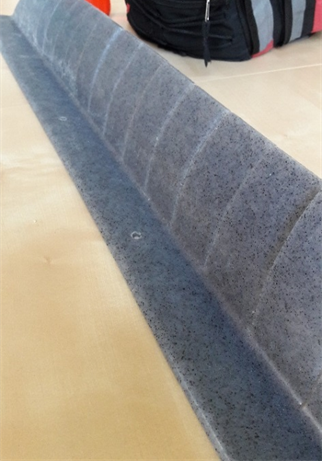 We were introduced to an innovative product as an alternative for wooden baffles within a culvert (image on the right) – a more flexible product made of recycled rubber and plastics which is capable of holding back a lot of water as well as bending during high flows to release debris, and create eddys encouraging flow variation. The pliable material is able to bend to fit the bottom of the culvert, for more efficient flow control. The group engaged in conservation about the product and its benefits and potential drawbacks, and discussed other options for culvert enhancements, looking back over the morning’s visits. We then set out for our afternoon visits. 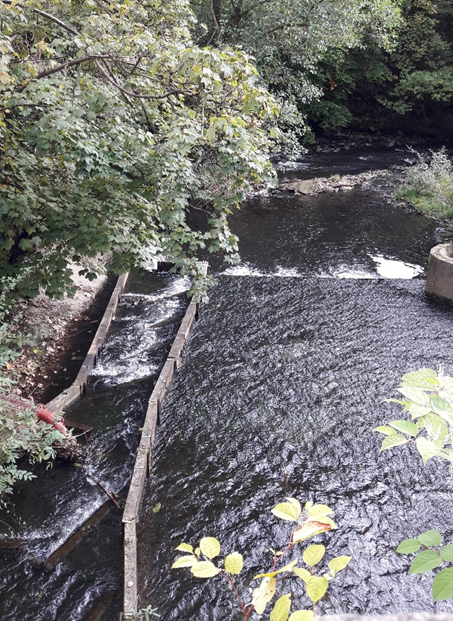 The first stop was at the Sirhowy River, where we observed the results of weir removal and enhancement consisting of 6 separate rows of rock to break up the channel slope. 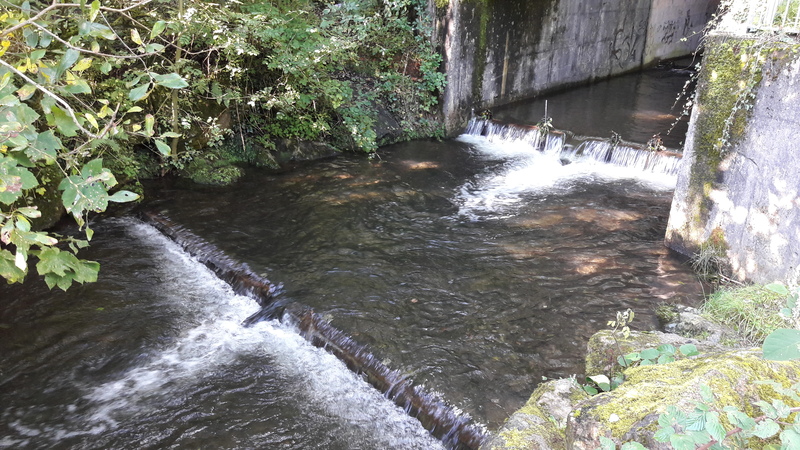 Our final visit was to a series of fish passes installed on the Rhymney River and its tributaries north of Bargoed (image below). We visited a weir notching project where 4 rows of blocks and wooden baffles have been installed to create steps. These wooden structures were only installed a month ago, so Groundwork are keen to see how the river responds and if a pooling effect develops over the next few months. 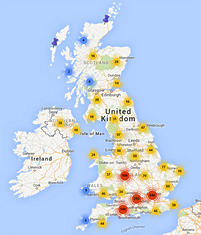 Groundwork have recently secured funding for 17 more barrier removals in Wales in the next 18 months – we can’t wait to see how these future restoration schemes turn out. RRC would like to thank all those who attended the site visit – the Welsh weather was far from what was expected, and the sun came out for us, making the day even more enjoyable! Thank you to Matt and Gail from Groundwork and Richard from NRW for spending the time showing us around the Healthy Rivers Project sites – and thank you to all volunteers who helped implement these restoration schemes throughout South East Wales.